There was a day in which Rick Wise beat the Cincinatti Reds by himself. Sure, he had some fly catchers parading in the outfield and some speedbumps in the infield to catch the ball but Rick Wise could have taken the mound June 23, 1971 with a bounce-back screen behind homeplate and 6 well trained golden retrievers and handed the Big Red Machine the loss. While seemingly a special moment for the Philadelphia Phillies organization and Mr. Wise himself, it was the 175 No-Hitter in baseball history up until that point. Wise took his Wonderboy with him to the plate that day, taking both Ross Grimsley and Clay Carroll deep. Between 1960 and 1976, roughly 54 no-hitters were thrown in Major League Baseball. I'm not really going to get into the other no-hitters that video still exists of however, generally speaking, only small snippets of the ends of the games still remain. What would generally happen is someone would begin to realize that a no-hitter was being thrown and whether it was a station manager, fan with a kinescope at home or maybe someone with the team would begin to record the final 12 or so of the 27 outs. If lucky, today we can find maybe the last two innings of the game have been preserved. That is what appears to be the case with Mr. Wise's special day. Above we see Wise smacking his 2nd homerun, this one off of Clay Carroll. Thanks to retrosheets again, we know that this happened in the Top of the 8th inning. Next, as the legendary baritone voice of Harry Kalas tells us (why do I suddenly feel like eating soup?) , Wise retires Tommy Helms with a groundball to the shortstop...which was the 3rd out of the 8th inning. There is nothing shown that would indicate the Top of the 9th inning was recorded but it would seem rather odd for someone to stop the recording while the Phillies were batting. Finally, Pete Rose lines out to the Golden Retriev...er, John Vukovich at 3rd base for the 27th out of Rick Wise's remarkable day. The dogpile (pun intended) that ensued with Phillies players was all captured in this recording as well. 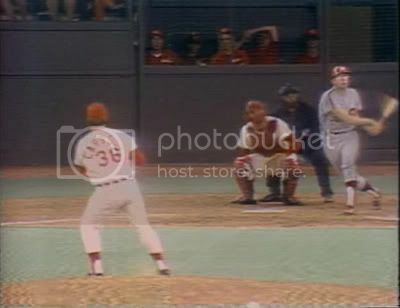 Like most no-hitters during this time period, being a regular season game...it would have taken either sheer luck that someone was recording the game that night or foresight by the Phillies, Reds or the station manager to keep a copy of this recording on file. We have no idea if any of these things happened. What we do know is that MLB has in their possession at the very least the final 6 outs (both Home and Away) of one of the most remarkable games a pitcher has ever had. We also know that there was an actual television broadcast of this game recorded and aired by the Philadelphia Phillies. As for what else exists? Ask MLB. With the 1957 Milwaukee Braves World Championship team wrapping up their 50th Anniversary, it seems like as good a time as any to look at just what is available from that game. Over the past 2 years, Doak Ewing, the President of Rare Sportsfilms has opened up his archive (which rivals that of MLB) and allowed rarely seen full broadcasts of the Series to be displayed. 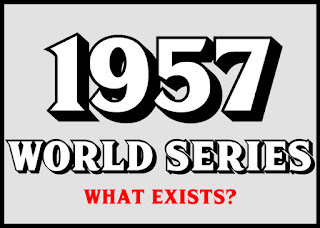 On Saturday, February 3, 2007, The Ken Keltner Chapter, Milwaukee, WI, of The Society For American Baseball Research presented Game 7 of the 1957 World Series in its entirety. Doak Ewing, President of Rare Sportsfilms, Inc., shared the only known copy of the game at the Chapter's quarterly meeting. 1957 World Series Game #3 at County Stadium, Milwaukee - Bob Turley vs Bob Buhl - the entire game, missing only Kubek’s second home run! It was the first World Series game ever played in the state of Wisconsin! It was also the first time that centerfield and behind-the-plate cameras were used for telecasting a World Series game, a new idea that brought NBC rave reviews from fans around the country! Mickey Mantle, Hank Aaron and Tony Kubek (2) hit home runs! The game sets a W.S. record with 19 walks and the Braves leave the bases loaded four times! Mel Allen and Al Helfer. 3 hours, 1 minute, Kinescope. Our next meeting will take place on Saturday, February 2, 2008, 11 AM, at Long Wong's Chinese-American Sportsbar, 5230 W. Bluemound Road. This meeting will feature, courtesy of Doak Ewing, President of Rare Sportsfilms, a showing of the ENTIRE game 4 of the 1957 World Series. You know what happens, but this will be great to watch. We'll also have a 50-50 raffle, raffles for neat items, and memorabilia for sale. Reservations are recomended. I was able to find another rumor on an internet message board that Ewing had a completely copy of Game 1, but was unable to confirm the existences of that kinescope. I’m going to start today with a game that I don’t know if it exists or not. Not exactly the right foot to start off on. However, my whole hope of this blog is to archive the available games that may be out there in hopes of a) wriggling them away from MLB’s oppressive grip or b) making sure that the fans know what actually does exist, either in MLB’s rarely opened vaults or from collector’s scattered across the globe. This brings me to the game in question. In Ken Burns' Baseball, Burns profiles Roberto Clemente’s tumultuous 14 month span in which he solidified his legacy as both a baseball player (1971 World Series, 3000 Hits) and as a human being (dying on a humanitarian relief effort to Nicaragua). 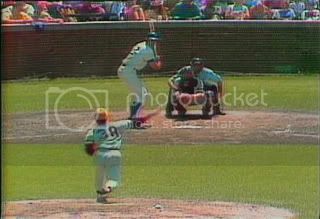 In this ‘9th Inning’, as a montage of highlights are shown to sweet guitar strumming of Carlos Santana’s ‘Oye Como Va’ of Clemente’s out of this world performance, a brief clip of a sliding grab at Wrigley Field is shown. Let’s start with the basics: The uniforms. Based on the NBHOF’s Dressed to the Nine’s exhibit, The Pittsburgh Pirates during Clemente’s lifetime only wore the road grey pullovers with the yellow cap from part of 1970 until Clemente’s death following the 1972 season. So, for this game, we’ve narrowed it down to 3 seasons, 1970, 1971, 1972. To further narrow it, using the same DTTN source, the Chicago Cubs would switch to the pullover home pinstripes with blue collar in the 1972 season. So this game broadcast had to have taken place in either 1970 or 1971. Now, let’s try to fill out the players that are on the field. In the first part of the clip, a Pittsburgh Pirates right-handed pitcher #38 is pitching. If we are to believe Ken Burns' accuracy on using footage from Clemente’s 1970 or 1971 season (and really, should we since this scene is from the regular season and the piece is discussing his postseason attack) then the pitcher pictured is Bob Moose. According to Baseball Almanac, Bob Moose pitched for the Pittsburgh Pirates from 1967 to 1976 and wore the #38 every one of those seasons. The batter’s number is unclear. What is apparent is that the final number on his uniform is ‘2’. For the 1970 Cubs, players who had uniform numbers ending in 2 were: Jim Cosman (32), Jim Dunegan (32), Milt Pappas (32), J.C. Martin (12), and Paul Popovich (22). For the 1971 Cubs, players who had uniform numbers ending in 2 were: Milt Pappas (32), J.C. Martin (12), and Paul Popovich (22). 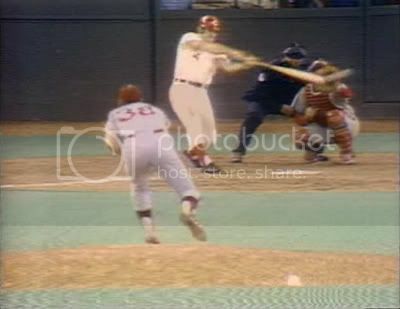 To further narrow this down, the hitter in the video clip is batting left-handed. The pitchers Cosman, Dunegan and Pappas all bat right handed, eliminating them. Whittling down the list to Martin (a catcher) and Popovich (backup infielder), both players hit from the left side of the plate during the 1970 and 1971 seasons, both are white so none of that helps narrow things down. Before we move on using the games that Moose and Clemente were involved in, let’s look at the final person in the footage. The centerfielder for the Pirates in this scene is left handed. The 1970 Pirates the only left-handed outfielders they had were Matty Alou (18), Al Oliver (16) and Willie Stargell (8). For the 1971 Pirates, the only left-handed outfielders they had were Vic Davalillo (18), Al Oliver (16) and Willie Stargell (8). We know it ain’t Pops. The outfielder has a double digit number on the back. It’s pretty obvious the number is 16, but I won’t rule out my failing eyesight and I’ll leave in Davallilo/Alou. In 1970, Alou played 152 games in CF for the Pirates. In 1971, Al Oliver played 116 games in CF for the Pirates. Day game at Wrigley Field. Game during 1970 or 1971 season based on uniforms (Thanks Dressed to Nines). Pirates RHP #38 Bob Moose is the pitcher on mound (Thanks Baseball Almanac). Cubs hitter is either J.C. Martin (12) or Paul Popovich (22) (Thanks Baseball Almanac). Now, let’s dig into Bob Moose’s (or is that Meeces) game log. In 1970, Bob Moose pitched 2 games in Chicago against the Cubs. May 27th - both Matty Alou and Clemente started. Both Popovich and Martin pinch hit. In Popovich’s at-bat, he got a single to RF. JC Martin hit a flyball to RF. So, we’ve met some criteria. One small oversight that I hadn’t brought up yet; there were no runners at 1st or 2nd base. 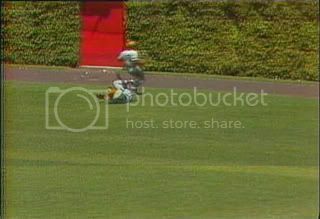 When Martin hit his flyball in this game, Cleo James should have been standing on 1st base. Likelihood: 7 out of 10. September 12th - Clemente didn’t play. Likelihood: 0 out of 10. In 1971, Bob Moose pitched 3 games in Chicago against the Cubs. 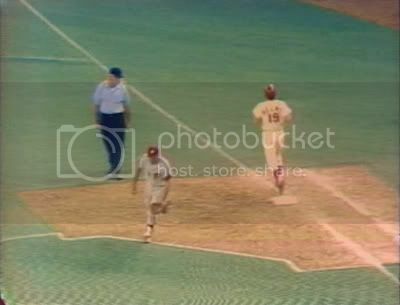 June 9th - Clemente and Oliver started as Davalillo would pinch hit but not play the field. For the Cubs, Martin sat and Popovich walked, grounded out, popped out on the infield and singled to RF. July 2nd - Clemente and Oliver started. Popovich and Martin both started. Popovich in the 1st lined out to RF with no one on. In the 3rd, Martin flew out to RF to lead off the inning. In the 7th, Martin would leadoff with a lineout to CF and Popovich would flyout to CF with a runner on 1st. Likelihood: 9 out of 10. September 14 - Davalillo would start in CF with Clemente in RF. Popovich would play the whole game at 2B. Moose would pitch in relief from the 5th inning on. Popovich faced Moose twice, popping out to the shortstop and grounding into a force out. Likelihood: 1 out of 10. All Boxscores provided by Retrosheets.com. And then there were 2. May 27th, 1970 and July 2nd, 1971. If my eyes are to be believed, this is a no brainer. It is the July 2nd, 1971 game in which Al Oliver started in CF, Clemente in RF and Clemente caught a ball hit by Popovich in the 1st and Martin in the 3rd. Now, the interesting part comes in deciphering which at-bat or inning this was. To bring this whole study to conclusion, based on the tint of the color of the footage and the camera setup used, this appears to be an NBC Game of the Week. The July 2nd Game was on a Friday. Without access to a 1972 schedule, it is almost impossible to determine if this is the game in question. Anyone with a schedule or access to archived TV listings, please share. Ultimately, it is unknown whether this full broadcast exists or not. Without being able to directly ask Burns or without finding a collector with this broadcast in their collection, it becomes increasingly difficult to track down. A quick Google, Ebay and various listing sites shows no copies of ANY regular season games in 1971. Perhaps this game too has vanished.